Victor Harbor is a town in the Australian state of South Australia located within the City of Victor Harbor on the south coast of the Fleurieu Peninsula, about 80 kilometres (50 mi) south of the state capital of Adelaide. The town is the largest population centre on the peninsula, with an economy based upon agriculture, fisheries and various industries. It is also a highly popular tourist destination, with the area's population greatly expanded during the summer holidays, usually by Adelaide locals looking to escape the summer heat. Adare House, built in 1893. The building is now owned by the Uniting Church Australia. Traditionally home of the Ramindjeri clan of the Ngarrindjeri people, the bay on which Victor Harbor sits was discovered by Matthew Flinders in HMS Investigator on 8 April 1802. As part of the first circumnavigation of the continent, Flinders was surveying the then unknown southern Australian coast from the west. He encountered Nicolas Baudin in Le Geographe near the Murray Mouth several kilometres to the east of the present day location of Victor Harbor. Baudin was surveying the coast from the east for Napoleonic France. Although their countries were at war, each captain was given documents by the other nation's government, stating that the ships were on scientific missions, and were therefore not to be regarded as ships of war. Together, the ships returned to the bay and sheltered, while the captains compared notes. Flinders named the bay Encounter Bay after the meeting. In 1837 Captain Richard Crozier who was en route from Sydney to the Swan River Colony in command of the Cruizer-class HMS Victor, anchored just off Granite Island and named the sheltered waters in the lee of the island 'Victor Harbor' after his ship. [full citation needed] About the same time two whaling stations were established, one at Rosetta Head (popularly known as "the Bluff") and the other near the point opposite Granite Island. Whale oil became South Australia’s first export. From 1839 the whaling station was managed for a time by Captain John Hart, a later Premier of South Australia. The town of Port Victor was laid out on the shores of Victor Harbor in 1863 when the horse-drawn tramway from Goolwa was extended to the harbour. The last whale was caught off Port Victor in 1872. The town's name was changed to 'Victor Harbor' in 1921, as a result, it is said,[by whom?] of a near shipwreck blamed on confusion with Port Victoria on the Yorke Peninsula. Despite harbour normally being spelt with a "u" in modern Australian English, the name of the city is spelt Victor Harbor. This spelling, found in several geographical names in South Australia, including Outer Harbor, coincided with the popularity in early Australian English of American spelling, for reasons that remain unclear. Victor Harbour railway station is spelt with the u. At the start of the 20th century, an attempt was made to make Port Victor, as it was then called, a main stop of mail-steamers. On 26 December 1936, a one-off motor race meeting was held to the east of the town to commemorate the centenary of South Australia - the "South Australian Centenary Grand Prix". The circuit was made of public roads, measured 12.6 kilometres in length and featured two long straights, two short straights, and several corners, including the banked Nangawooka Hairpin. Winner of the 240 mile Grand Prix, which was held as a handicap, was Les Murphy in an MG P-type, from Tim Joshua in another P-type and Bob Lea-Wright in a Terraplane Special. In 2016, the resident population of Victor Harbor was 4,233 but over the summer holiday season the population almost triples. At the 2016 Australian Census, the urban population for Victor Harbor together with nearby Goolwa was 25,503. Victor Harbor was declared a city in 2000. As a local government area, the City of Victor Harbor includes the surrounding rural area and the contiguous township of Encounter Bay as well as the town of Victor Harbor itself; its total area is 34,463 hectares. It shares boundaries with the District Council of Yankalilla and the Alexandrina Council. 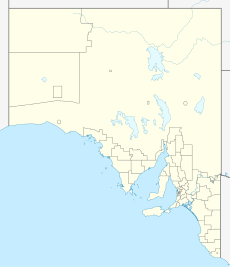 The city is in the state electoral district of Finniss and the federal Division of Mayo. 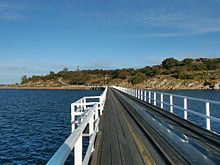 A popular site for visitors is Granite Island, which is connected to the mainland by a short tram/pedestrian causeway. The tram service is provided by the Victor Harbor Horse Drawn Tram, one of the very few horse-drawn tram routes remaining in public transit service. Granite island is home to a large colony of little penguins which are a popular attraction on the island. These penguins shelter on the island during the night, departing in the morning to hunt for fish before returning at sunset. Sadly this colony of penguins is now almost gone. At the last count in 2012, only seven were found. It is suspected that an increase in New Zealand fur seals in the area may be to blame, however incidents such as those in 1998 where locals apparently kicked several of them to death have also contributed. The SteamRanger Heritage Railway runs train services, most notably The Cockle Train between Victor Harbor and Goolwa, along the Victor Harbor railway line. During the months of June to September, whale spotting is a popular attraction. Southern right whales come to the nearby waters to calve and to mate. The South Australian Whale Centre located at Victor Harbor provides hands-on interactive activities and presentations as well as information and whale watching tips. Greenhills Adventure Park offered activities including: waterslides, canoes, rock wall climbing, archery, mini golf, and go-karting, however this attraction has since closed down. Victor Harbor is the centre of the surf zone known as the "South Coast" to Adelaide and local surfers. Popular surf beaches in the area include Parsons, Waitpinga, Middleton and Goolwa. The Granite Island breakwater usually shields the town from waves. Victor Harbor also offers numerous fishing opportunities varying from offshore reefs for larger boat based anglers to excellent surf fishing on the beaches closer to the Murray Mouth. The main newspaper printed locally is the Times (1987–). The newspaper was originally published as The Victor Harbor Times and Encounter Bay and Lower Murray Pilot, with the first edition published on Friday 23 August 1912. On 16 May 1930, the title was briefly altered to Times Victor Harbor and Encounter Bay and Lower Murray Pilot, and on 15 April 1932 until 31 December 1986 it was called Victor Harbor Times. Other historical publications included the short-lived South Coast News (4- 25 June 1965), printed by A.H. Ambrose, and its "successor", South Coast Sports News (20 June - 4 July 1969), printed by The Ambrose Press. This town hosts a three-day Schoolies Week festival in late November mainly for South Australian school leavers. Victor Harbor hosts the second largest Schoolies Week Festival in Australia after the Gold Coast, centering around official activities held by the organisation Encounter Youth in Warland Reserve. The centre of the town is a dry zone and hosts various live music and other events for participants. Another notable event is the Art Show run by the Lions and exhibits of paintings are shown from all over Australia. The event is during the summer holidays in January and has grown to become the largest and one of the most prestigious displays of its kind. Victor Harbor has a warm summer Mediterranean climate (Koppen:Csb). Summer average temperatures are significantly lower than most of the state, due largely to the sea breeze moderating temperatures and hot northerlies rarely extending past the hills north of the city. ^ a b Australian Bureau of Statistics (27 June 2017). "Victor Harbor (State Suburb)". 2016 Census QuickStats. Retrieved 20 April 2018. ^ "Victor Harbor, South Australia". Postcodes Australia. Retrieved 2 August 2015. ^ "District of Finniss Background Profile". ELECTORAL COMMISSION SA. Retrieved 2 August 2015. ^ "Why is Victor Harbor spelt without the 'u'?". Archived from the original on 12 March 2011. ^ "LANDING THE ENGLISH MAILS AT PORT VICTOR". Southern Argus (Port Elliot, SA : 1866 - 1954). Port Elliot, SA: National Library of Australia. 12 September 1901. p. 3. Retrieved 20 July 2013. ^ a b Walker, Terry (1995). Fast Tracks - Australia's Motor Racing Circuits: 1904-1995. Wahroonga, NSW: Turton & Armstrong. p. 170. ISBN 0908031556. ^ Galpin, Darren. "Victor Harbor". GEL Motorsport Information Page. Retrieved 1 April 2016. ^ Australian Bureau of Statistics (27 June 2017). "Victor Harbor - Goolwa (SUA)". 2016 Census QuickStats. Retrieved 20 April 2018. ^ "Island security under review". Times. 25 June 1998. p. 1. Retrieved 17 August 2015. ^ South Australian Whale Centre Accessed 3 September 2012. ^ "The Victor Harbor Times and Encounter Bay and Lower Murray Pilot (SA : 1912 - 1930)". Trove. Retrieved 24 February 2018. ^ "Times Victor Harbour and Encounter Bay and Lower Murray Pilot (SA : 1930 - 1932)". Trove. Retrieved 24 February 2018. ^ "Victor Harbour Times (SA : 1932 - 1986)". Trove. Retrieved 24 February 2018. ^ South Coast news [newspaper: microform]. Victor Harbour, S. Aust: A.H. Ambrose. 1965. ^ South Coast sports news [newspaper: microform]. Victor Harbor, S. Aust: The Ambrose Press. 1969. ^ "Schoolies Festival™ Victor Harbor | Encounter Youth". Encounter Youth. Retrieved 11 September 2018. ^ "Climate Data Online for Victor Harbor (Weather station closed 01 Apr 2002)". Australian Government, Bureau of Meteorology. Retrieved 14 January 2018. Wikimedia Commons has media related to Victor Harbor, South Australia. Wikivoyage has a travel guide for Victor Harbor. This page was last edited on 7 April 2019, at 22:36 (UTC).